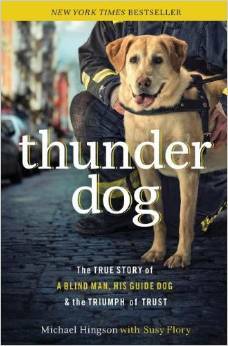 Thunder Dog tells the story of Michael Hingson and Roselle, his guide dog. Michael was working in the World Trade Center’s North Tower on the 78th floor on the morning of September 11, 2001. The book gets its title from the fact that Roselle was very afraid of thunder and, during the wee hours of September 11th, there had been a thunder storm which woke both dog and handler – with handler providing emotional support. The book starts with a chapter ‘Goodbye to a Hero’ in which Hingson tells us that Roselle died on June 26, 2011. This is not entirely surprising – virtually all of the dogs who had involvement in 9/11 have since passed away. It is, sadly, to be expected. This book is written in a conversational style, as if Hingson was giving an interview (he did, many in fact, after the 9/11 attacks – television presenter Larry King writes the Foreward to the book). It makes for very easy reading. Interspersed with chapters detailing the long walk down from the 78th floor as dog and handler evacuated, Hingson tells us more about his life. He wasn’t born blind, for example. He was a premature baby and back when he was born, babies were put into incubators with a very high oxygen environment (it wasn’t until later when many babies ended up surviving, but blind, that doctors became aware of the cause). Roselle was not Hingson’s first guide dog, either. And Hingson’s parents encouraged him to explore his world; he even rode a bicycle around his neighborhood without assistance – learning to navigate by echolocation. But the horrors of that day, and the strong bond between man and dog are what this book is really about. How Hingson had to rely on Roselle more than ever, whilst remaining calm for her so she could do her job. And how Roselle offered terrified people emotional support on a day like no other. Hingson’s recollections of short conversations with firefighters who were climbing up the tower to fight the fire and assist in rescue are most poignant. Roselle’s legacy lives on in the Roselle’s Dream Foundation which has since been established by Mr Hingson to honor her memory. Throughout the book, Hingson emphasizes that being blind did not stop him from having a normal life and so the Foundation does its best to support scholarships to enable blind people to live their lives to the fullest. The Foundation also exists to educate the sighted about blindness. A book well worth reading. It spent time on the New York Times Bestseller list. Researcher Juliane Kaminski has published a study which shows that domestic dogs are much more likely to steal food when they think nobody can see them. Many owners may think ‘so what – I already knew this’ – but Dr Kaminski’s systematic study helps to prove that dogs have the capacity to understand the human’s point of view. The study found that when a human forbids a dog from taking food, dogs are four times more likely to disobey in a dark room than a lit room, suggesting that they understand humans may not be able to see them take the food. The tests were complex and involved many variables to rule out that dogs were basing their decisions on simple associative rules, for example, that dark means food. 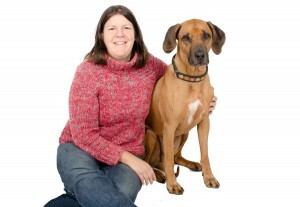 42 female and 42 male dogs took part in the study. This is the first study to examine if dogs differentiate between different levels of light when they are developing strategies on whether to steal food. The research is an incremental step in our understanding of dogs’ ability to think and understand which could, in turn, be of use to those who work with dogs, including the police, the blind and those who use gun dogs, as well as those who keep them as pets. Dr Kaminski’s study has been published in the journal Animal Cognition.